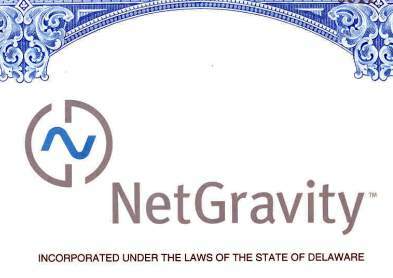 Beautifully engraved Scarce low number (#772) certificate from NetGravity, Inc. 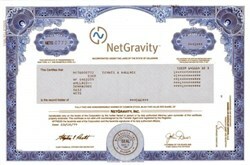 This historic document was printed by the Security Columbian Banknote Company and has an ornate border around it with a vignette of NetGravity's logo This item has the printed signatures of the Company’s President and Secretary. This si the first time we have had this certificate for sale. On July 13, 1999, Internet advertising firm DoubleClick announced it was acquiring rival online advertiser NetGravity in a stock transaction valued at about $530 million. In a bid to dominate Internet advertising, DoubleClick hoped the stock-for-stock transaction will help reach both companies' goals of providing the broadest possible infrastructure for ad management, data solutions, and media sales for Internet publishers, advertisers, and merchants. DoubleClick provides global Internet advertising solutions for marketers and Web publishers, while NetGravity provides interactive online advertising and direct marketing software solutions.